As seen in "MythBusters: Shooting Fish in a Barrel." Explanation: About 8,000 years ago, Central and South Americans began adding hot chilies to their food. Odds are, that's also when people started searching for ways to cool a spicy mouth, and for years, plain-old milk has been one of the favorites. But are there better means than a glass of cow juice for quenching a fire caused by chomping on hot chilies? From plain water to tequila, the MythBusters put viewer-recommended cures to the test. 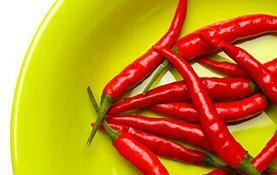 Chilies contain a substance called capsaicin that makes taste buds sting. When capsaicin pings taste buds, these heat-detecting neural sensors send a message straight to the brain: "fire!" Milk, however, contains casein, a fat-loving compound that binds with spicy capsaicin oil and then washes it away. So, will a few gulps of cold water or beer ease the pain as well as milk does? No dice. The drinks may offer brief relief, but because oil and water don't mix, these water-based liquids will actually spread the oily capsaicin rather than reduce its effect. Alcohol could help by dissolving the capsaicin oil, but there's not enough alcohol in beer to conquer the painful burn. Truth is, you might have to drink 10 ounces of 70-proof tequila to dissolve 1 ounce of concentrated capsaicin compound. Apparently when it comes to beating a mouth-sizzling burn, milk really does the body good.